18cm Tall No breaks- some paint wear to rim and base and a couple of chipped off on body- pictured a great design piece Do check out my other items as I’m happy to combine p&p, thanks! THESE WERE GIVEN TO MY BROTHER FROM A HOUSE HE WAS WORKING AT HE SAID IT WAS A MANSION LOL! ANYTHING WITH MORE THAN ONE BEDROOM WOULD BE A MANSION TO HIM! ANYWAY I TRIED TO LOOK ON THE INTERNET TO FIND OUT MORE ABOUT THESE AND ALL I CAN SEE IS THAT THEY COULD BE VERY VERY OLD AS THE TOWN IS IN RUINS?. THIS SET IS IN GOOD ORDER AND ALL MARKED ON THE BASE WITH ANFORA AGUEDA,PORTUGAL. THIS SET IS IN GOOD ORDER AND CAN BE USED FOR A NUMBER OF SERVING USES! We are very close to Junction 13 of the M60 in Worsley - Manchester. Square dish: 17.5cm wide x 2.5cm deep. round dish: 15cm wide x 3cm deep. blue and cream floral design. hand painted. made of terracotta material. 2 pieces of Portugese pottery. THIS VASE HAS GILTED DETAIL/PATTERNS AND IS IN GOOD ORDER! A pottery hand made and glazed water or fruit juice jug. Great with flowers in it too. Rustic and made from terracotta clay. In great condition. No chips or cracks. Measures 20cms tall UK postage only. Use global shipping programme for international postage through ebay. Will be proof of postage and GPO tracked. Postage includes postage and packaging. Free local collection available. 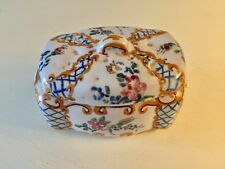 In good condition no damage to the front one small chip on the back see pics Check out my other items I'm happy to combine postage Very large Vintage Portugese Hand Painted Ceramic Pottery Charger Plate 15" DIA. 8 cm high. Very pretty little piece, would make a lovely gift. BEAUTIFUL LARGE HAND PAINTED PLATTER. Lovely for display or beautiful serving platter. Not a matching pair but look lovely together. Stunning colours and design - the photos do not do justice. Lovely condition. Pair of Pereiras Pottery Planters. A good pair of hand painted Pereiras Pottery Planters. They are painted with rural scenes, and the chickens are particularly wonderful. if you can't do that for any good reason, let us know. Candle plate made from pretty red glass with abstract gold motif. Sculpted to take a candle or large tea light (see picture). Lovely 25.5cm Portuguese vase in excellent condition. Beautiful item!